Working with communities to create significant and meaningful impacts both to the environment and to its people. 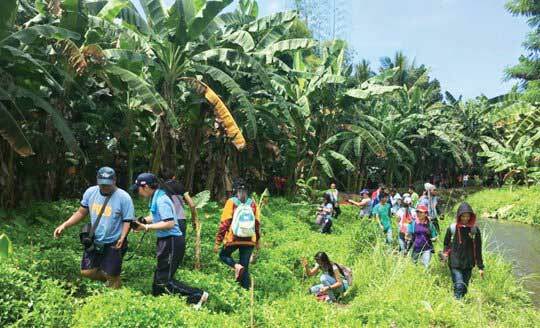 Protecting the environment has been one of the many advocacies of the ABS-CBN Foundation. The rapid degradation of the environment and neglect of the country’s resources were the core concepts in the creation of Bantay Kalikasan (Environment Watch) in 1998. After two decades of service to the Philippine environment, Bantay Kalikasan is now biggest media-led environment organization of the country. As the country’s environmental problems continue to evolve, so do the efforts of Bantay Kalikasan. Starting out with initiatives such as Bantay Baterya at Langis (BBL) which focused on responsible waste disposal, the organization has expanded its mandate by helping to build better, more sustainable communities. The protection of biodiverse areas, eco-tourism, and job generation are at the core of Bantay Kalikasan's current programs. In recent years, Bantay Kalikasan has also led a Metro Manila initiative to revive the beauty of Pasig River. Run for Pasig River, a yearly marathon for the ongoing rehabilitation Manila rivers, has successfully engaged more than 500,000 people from its creation in 2010. Bantay Kalikasan plans to continue immersing itself more in local communities to have a greater, and more meaningful impact to the environment. In addition, Bantay Kalikasan, through the ABS-CBN Foundation, promises to continue using its media leverage to inform the public of environmental issues that need to be addressed.